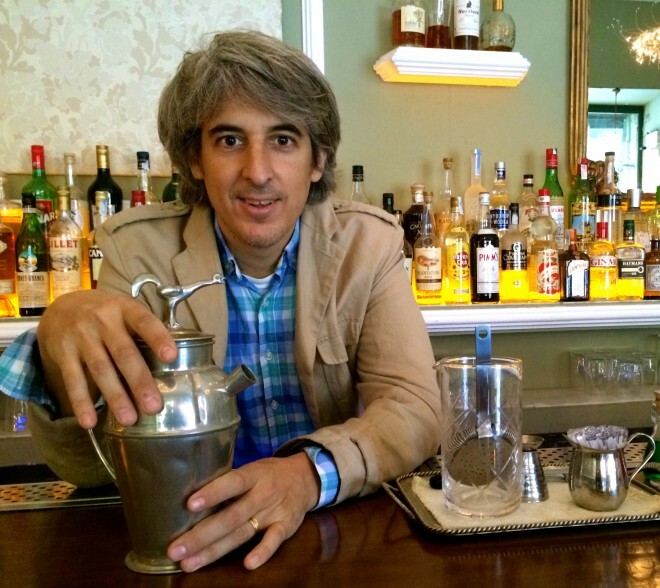 I’m Alberto Martinez and I’m the bar manager and owner of 1862 Dry Bar in central Madrid. I used to be an engineer but with the downturn in Spain I had to find another job. For a long time I was a big fan of the old classic bars like Boadas in Barcelona or Del Diego in Madrid. I didn’t know how to open a cocktail bar, but I was sure that I wanted to make classic cocktails, because that’s what I like to drink. Then, I worked in a vodka and gin shop where I made martinis which were a success, so when I had the opportunity to open a bar just in front of it, even if it was a shell, I jumped at the chance. The building where I created the bar was built in 1862 and it’s also the date of the publication of Jerry Thomas’ book and that”s why my bar is named 1862 Dry Bar, because that’s the kind on cocktails I want to make. I even bought an original edition of Jerry Thomas’ book. So now I’ve been a bartender for the last 4 years and I enjoy what I do. Even if the crisis is over, I won’t go back to my previous life as I love what I do now… not only the cocktail making, but also the hospitality side and I have to manage a team which reminds me of my management role as an engineer. It would be just like my own bar but would open earlier, before lunch in fact. To do this I need a licence for food. I would also like to have live music, a jazz band which would require a bigger place with maybe two levels. Otherwise I would create a dive bar where you can sit and have food. I don’t go out much to party, but once a week I try to go to cocktail bars to see experienced bartenders and learn more. Otherwise if I had more time, I’d go to listen to live music. For cocktails, I prefer american whisky, Rye or Bourbon. But to mix, I prefer Rye, even if here in Spain it’s difficult to find proper Rye whiskey like Bulleit Rye or Sazerac. It’s the perfect spirit for a good manhattan. It’s about the balance. You get the main spirit, then one or two ingredients to match. I am classic like that. Like for a whisky sour, the right balance between lemon and sugar is important so you can still feel the whisky. The product I want to introduce are liqueurs like maraschino. With rye or bourbon they match perfectly.